I heard a rumor that this long lasting slow roasted pork serving of a place has shut down its door, any one heard any truth to this rumor? I know it was nothing to die for, but this is the place I had my first slab of ribs and gererations of family have dined here. 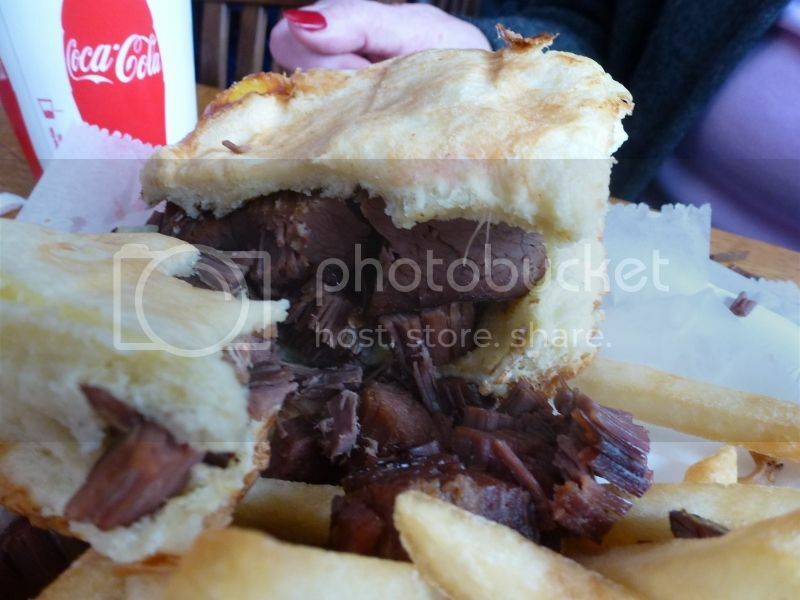 Actually I was there about a year ago and found the bbq beef sandwich to be not so bad, even though its not on my go to list im hoping this rumor is false. That rumor comes up every now and again. Not true...so, the good news is, you can still get a "not so bad" Russell's sandwich. Although I saw an unruly patron being dragged out of the Algonquin Road location in handcuffs last Saturday, the place still seamed to be open for business. Note: I witnessed this from the parking lot next door. I was not eating there and did not see what led to the authorities being called. No doubt the land on which the Russell’s on Thatcher Rd. sits has value from a real estate development standpoint; a perfect place for condos, across the street from the forest preserve. Thankfully, though - the owners seem inclined to keep the place open. The pork sandwich Russell's serves is one of the best - of any kind - I've eaten in Chicago, and that’s what I go there for. I've been eating at that restaurant location for almost 30-years now - and still recommend it highly. Different strokes for different folks! A fine GNR candidate. I believe Russell's pork sandwich is the worst- of any kind i've ever eaten in my life. Yuck! I'm with you Grant- I don't get why anyone goes to this place. I understand nostalgia goes a long way, but at least go to the Choo-Choo in Des Plaines. I don't trust any place that calls themselves a BBQ restaurant, but there's no smoke smell inside or out. The sauce is slightly thicker than water and the meat's always dried out. Yes, nostolgia does go a long way in regards to the enjoyment of certain foods. I've enjoyed Russell's sandwiches for over fifty years, starting as a toddler. In the days before McD's and such, this was family fast food. Is it the greatest? Of course not. But I have so many good memories of the many years of going to Russell's, both with my parents and, later, when I brought the kids. It may not be every one's idea of the perfect meal, but in my mind, with the added memories, it is on my list. Their sandwiches don't seem as good as they used to be, but I've had some good soups there lately. Living in the neighborhood sometimes we would stop by to pick up a pound or two of the pork to go. A quick stop at a local grocery store for buns and sides and a family dinner is in hand. The bulk pork is packed in a plastic tub with a fair amount of juice which makes for a tasty sandwich. The juice is lightly seasoned, a touch salty with a good pork flavor. While far from traditional BBQ it does make for a good meal. I was in the area today with a friend, and landed here via hasty iPhone search. The Ribs: Stale, no smoke, and tasting of old fryer oil. The Brisket: asked for fatty slices, got rubbery beef funk; slight smoke flavor. The Sauce: overly sweet apples and cinnamon flavor, no vinegar what-so-ever. If you're within 1.5 miles of Russell's, Siri should be reprogrammed to say, "I found a McDonald's fairly close to you. Try the McRib." At least Johnnie's was nearby to wash the foul taste out of our mouths. After eating at Russells all of my life, (OK I have warm and fuzzy memories after 50 plus years) I can make the following rec: Stick with the sandwiches. They are not bad, don't be tempted with the other stuff. As another lifelong visitor to Russell's, I would also stick to the sandwiches. But even then with the caveat that you can't go there looking for real bbq. I like it for what it is though, and will miss them when I move next week. Count me as a lifelong Russell's fan and I too stick with the sandwiches. It is what it is and it's certainly not authentic BBQ. Unless they've changed the menu I've never seen brisket offered there. Is this a new menu addition? The Russell's in Rolling Meadows (Algonquin Rd.) closed. Well, I am not a fan of Russell's (although forced to go here occasionally). Fries are decent, pulled chicken is serviceable, I'm not a big fan of their sauce, but whatever you do, you probably want to avoid the krab cakes . . . yes, krab cakes. I'm fairly confident we're not talking about spelling errors here. Very dry with a little smoke flavor. Skip it. Better! Moist with a little smoke flavor. Not too much of an upgrade from the regular pork. Stick with the regular sandwiches (for what they are worth). The one thing that keeps me coming back to Russell's after all these years is their bbq sauce. Whatever they use- cinammon, apples, etc.- it's good. As a matter of fact, it's my favorite. 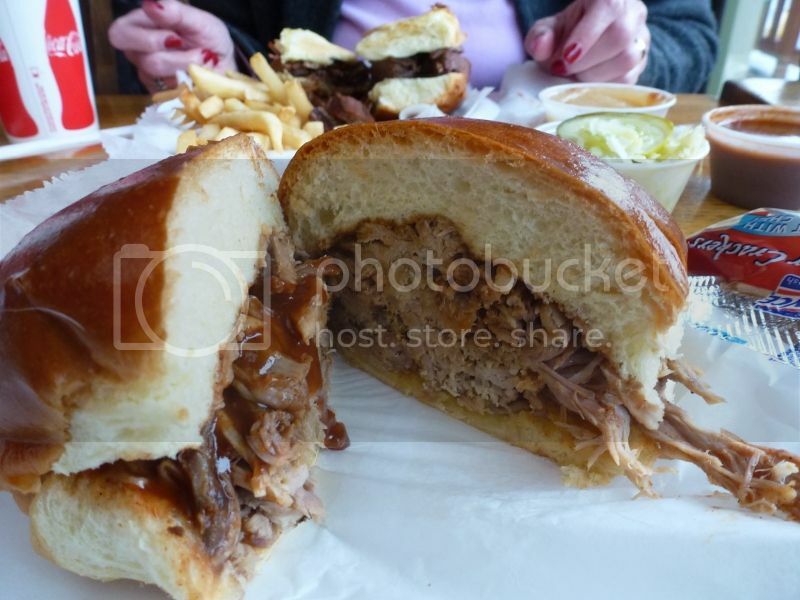 Are there better/more authentic pulled pork sandwiches in Chicago? Of course, and we all know where to go get them. Russell's pulled pork by itself is not authentic smoked pulled pork, but their bbq sauce is the reason many of us keep coming back. It's their signature item, and for really good reason- it's awesome. deepdish wrote: The one thing that keeps me coming back to Russell's after all these years is their bbq sauce. Whatever they use- cinammon, apples, etc.- it's good. As a matter of fact, it's my favorite. Are there better/more authentic pulled pork sandwiches in Chicago? Of course, and we all know where to go get them. Russell's pulled pork by itself is not authentic smoked pulled pork, but their bbq sauce is the reason many of us keep coming back. It's their signature item, and for really good reason- it's awesome. I don't mean to come off as challenging, but I'd be interested in knowing what you'd define as "authentic" pulled pork? I've been wrestling with the concept of "authenticity" for a while now. Don't know much about what style BBQ Russels is, but I call it "quirky" The thin sauce, and the vinegary cole slaw which used to be served with a wooden spoon or wooden utensils. Have not been there for years so do not know what its like now. As I recall the bbq beef or pork sandwiches would be good for lunch now, but back in the day it was so exciting to hear that we were going to Russels for dinner. There were no fast food restaurants then and it was a real treat. That was probably in the late fifies. Even though I do not now go to Russels, I would if it was near. But its nice to know I could if I wanted to. I think nostalgia dies hard. toria wrote: The thin sauce, and the vinegary cole slaw which used to be served with a wooden spoon or wooden utensils. I've never been there, but those are both plusses in my book. I like my BBQ sauce very much on the thin side, usually (bigger fan of the Carolina styles than the thick and sweet KC style). And when I make barbecue, the coleslaw I default to has no (or very little) mayo. That's one of the many things I like about Smoque--their austere, vinegary coleslaw. Smoked meat at Russell's sounds like more of an abomination than their standard beef or pork sandwich, unchanged in its comforting mediocrity since at least the late 70s in my memory. Those trying the place for the first time now would do well to run with the original sandwiches; I will warn that the fries, shakes (Island Oasis syrup nonsense), and slaw have all gone downhill. There is indeed still magic in the sauce. Yes I would go to the one in Elmwood Park. I would order only the sandwiches. In fact I can not remember ever eating anything else from there. Do not expect a Smoque like experience. This is quirky bbq an odd vinegary sauce with spices. Or do it, just to say you did. Yes or do it just to say you did. I would not make a special trip. Problem is its so close to Johnnies and I would rather go there for da beef. But who knows? There is no accounting for taste. Maybe some will find the sandwiches to their liking. I'm actually only interested in the sauce, but I wouldn't make a special trip out there. Like I said, thin, vinegary sauce is exactly what I like (that's not really quirky in and of itself--most commercial barbecue sauces, if I'm forced to use them, I have to cut 50-50 with apple cider vinegar to get them where I like 'em), but the descriptions in this thread are all over the map from sweet and no-vinegar to very vinegary. It sounds like the Rorschach test of sauces. My favorite BBQ sauce in the city is Lem's relatively thin clove-y vinegary sauce. Anyone care to compare the two? Binko wrote: I'm actually only interested in the sauce, but I wouldn't make a special trip out there. Like I said, thin, vinegary sauce is exactly what I like (that's not really quirky in and of itself--most commercial barbecue sauces, if I'm forced to use them, I have to cut 50-50 with apple cider vinegar to get them where I like 'em), but the descriptions in this thread are all over the map from sweet and no-vinegar to very vinegary. It sounds like the Rorschach test of sauces. My favorite BBQ sauce in the city is Lem's relatively thin clove-y vinegary sauce. Anyone care to compare the two? According to Google, it's carried locally at Walmart. Hmmm...I'm wondering about the "additional specifications" table which says "does not contain a battery." The other sauces don't appear to have that table. Do I need a battery to properly enjoy Russel's barbecue sauce? @David Hammond: As much as I still enjoy Russell's, I don't consider their sandwich an authentic pulled pork sandwich because I don't think the pork is actually pulled. Their menu doesn't even refer to their BBQ pork as pulled. Instead, their menu refers to the sandwich as "BBQ Pork- Thin slices of pork roasted to perfection and covered with our famous BBQ sauce." Other places in Chicago actually refer to their sandwiches as pulled pork sandwiches whereas Russell's does not. Similarly, I don't consider Russell's authentic pulled pork because it very much lacks that authentic smokey flavor of a true pulled pork sandwich, a la Smoque's pulled pork sandwich which is truly pulled and VERY smokey. Thus, what makes Russell's BBQ pork sandwich special is their very unique BBQ sauce. If you take away their unique BBQ sauce recipe, then the pork itself is nothing mind blowing because it's not really smoked in any way. Again, Russell's is all about the BBQ sauce, which is why I still go there, among a lot of other people. I very much like Russell's fish sandwich, too during lent.